I once found an old Webster's dictionary from 1934. It was published the same year that the Serenity Prayer was written by Reinhold Niebuhr. I was curious whether the words used in that familiar prayer had the same definitions in 1934 as they do today. Surprisingly, those old definitions shed a refreshing new light on many of the prayer's words. That inspired a set of twelve Drawings, illustrating the twelve principal words in the Serenity Prayer. Because that prayer is so closely associated with Twelve Step groups, I also looked up words found in key Twelve Step literature. One thing led to another and now there are four sets of "Twelve Drawings", including The Serenity Prayer, The Steps, The Promises, and the Metaphors. PLEASE NOTE: This website is not affiliated with any organization. Images on this site may be downloaded free for PERSONAL use only. Any other use, reuse, or sale is prohibited. All definitions are from 1934 Webster’s New International Dictionary, Second Edition (©G.&C. Merriam Co.). DISCLAIMER: Any errors in transcription are unintentional. This is a website created by one individual and it has no affiliation with or endorsement from the publishers of Webster's Dictionary or any Twelve Step literature. v. To take into the mind. comprehend v. 1. To take into the mind; to grasp with the understanding; to apprehend the meaning of; to understand. Why did I do that? Because that initial phrase seemed perfectly complete. The phrases which followed did reinforce or amplify that opening phrase, but they did not alter its basic meaning. I decided to "Keep It Simple". An expert in dictionaries may disagree with me and their reasons would probably be valid. This website is not reviewed by any experts, so please diregard anything that disagrees with what your literature or sponsor tells you. I admit this is an amateur effort. I remind you that there is no one here except me, an old dictionary, and a drawing pad. I strive to capture the spirit of each definition rather than catalog its many facets. Sometimes God speaks through geniuses. I hope He also speaks through fools, when necessary. My sponsor always encouraged me to look up Twelve Step words in the dictionary. I was not enthusiastic. Reading dictionaries is something I try to avoid. But I followed his directions and I am glad I did. His instruction deepened my understanding of early recovery literature and led to my series of drawings inspired by the Twelve Steps. At first, I looked up words using a recent dictionary. Then one rainy day, I ducked into a used book store and I noticed a Websters Dictionary that was published in 1934*. The date caught my eye because I remembered Alcoholics Anonymous co-founder Bill W. got sober around that time. Always perplexed by the quaint language used in the Big Book, I opened the old dictionary to read the OFFICIAL definition for some Twelve Step words. I flipped idly to a word I was having trouble with at the time: “God”. Webster’s 1934 definition of “God” was “a being of more than human attributes or powers”. It struck me at once that these words were similar to Bill W.’s phrase “a power higher than human power.” It was not identical—the words were different—but the essential meaning was the same. Curious, I looked up some other words from the Steps. In every case, the very first definition of each word seemed to reinforce Bill’s writing while also offering some fresh insights into several familiar words. Did Bill W. write the Big Book with a dictionary open in front of him? I strongly doubt it. At that time, the meanings of most words were commonly known. In the 1930s, the correct meanings of words did not change as quickly as they do today*. Words were chosen for their exact meaning—much more so than in today's culture. So, if Bill W. described something as being "cool", he was referring to its temperature, not its fashionable attractiveness. Ironically, reading those older definitions renewed my personal identification with the Steps. I still continue the habit and have collected and shared dozens of helpful word definitions. You might try it yourself. Your local library will probably have an enormous Webster's Dictionary somewhere in the back room (if libraries still HAVE books whenever you read this). Chances are, the librarians will be very pleased if you ask to see it for yourself. My point is simple. If you want to better understand any word, why not read its definition in a dictionary that was current when the writer wrote it? Keep It Simple. It is revealing that the publisher says the updates have occured "many times" when, in fact, those revisions were 20 to 30 YEARS apart. This website is not really about art. It is about Twelve Step recovery. I am not a professional artist and these drawings are not for sale. They are the result of a spiritual experience that has re-formed me. NOTE: If you are not familiar with the Twelve Steps of recovery from alcohol, drugs, or behavior-based addictions, this website is not an introduction or explanation. If you want an introduction to Twelve Step recovery, go to the official website of a national group. Some are included in the "Other Helpful Sites" list (lower right). If you are already in a Twelve Step program, please ignore anything you see here that does not align with the conference-approved literature in your particular program. I was born with the ability to draw. But for twenty years, my pen produced nothing more than a few nonsensical doodles. Then one day, I looked down and saw the "Serenity" drawing emerge from my pen. It was as startling as if the family dog suddenly stood on its hind legs and calmly recited Shakespeare's Romeo & Juliet. At that time, I had been in recovery for perhaps a year. I was surprised when more and more drawings sprang forth—it was inexplicable. Where were they coming from and where were they going? Then I remembered that people in Twelve Step meetings commonly offer "personal shares" or short talks. I recognized that my drawings were my own form of personal share. Not special; just different. My ink drawings are out of step with a world of colorful, high-resolution, PhotoShop images. To be honest, the reason I create old-school pen and ink drawings is because I don't know how to create anything else. The archaic style seems appropriate, since the subject is old-school Twelve Step recovery. Whether you know or care about alcohol or addiction recovery, I hope you will glance through these illustrations. Downloads are free IF they are for your PERSONAL use only. This artist remains anonymous. Maybe that sounds intriguing or mysterious, but it shouldn't. In Twelve Step recovery, anonymity is the spiritual basis of all Twelve Step Traditions (see Tradition Twelve). So while my identity is not really a secret, I am remaining anonymous to please the Higher Power that got me sober. As time permits, I am adding Artist's Comments to each drawing. There is not text with every drawing yet, so you may have to poke around to discover all of them. My comments explain exactly what that image meant to me in my recovery, for whatever that is worth. If you do not wish to read the comments, I suggest you not scroll down and, instead, simply enjoy the drawings alone. • Religious or Not? - twelve words taken from the 1934 Webster Dictionary definition of "religion"
Only four of the above sets are included in the website. More may be added in the future. Some of the new drawings can be seen in my Twitter profile. My ideas arise from prayer and meditation. Sometimes, the emerging illustrations startle me. Certain drawings (like "Courage") make my eyes brim with emotions every time I see them. My hair stands up as if God was pressing nearer to see. For that reason alone, I have continued. I have deliberately tried to avoid using classic symbols. For example, there are no mythical or Biblical images such as an angel hovering in the air while wielding a fiery sword. I wanted each drawing to contain things I have seen in real life—or reasonably might. That was important to me, because that's how Recovery was for me: drawn from real life. So, instead of mythical figures, there is a fairly ordinary looking squirrel in the Twelve Steps "Ready" drawing. His energetic leap is a visual reminder of a leap of faith I took in Step 6: feeling exhilerated and entirely READY for whatever was coming next. I hope you enjoy looking at the drawings. I hope they may make some small contribution to living better Today. I hope you will keep coming back. NOTE: All of my drawings and written material are protected by ©opyrights and I take those rights seriously. You may download whatever drawings or text you want for personal use. Any other use or reuse will require specific permission, obtained in advance by writing to [email protected] . National Twelve Step Organizations welcome and will be charged nothing for the use of my art when arranged in advance. All Twelve Traditions will be maintained. I confess I am a LITTLE obsessed with the historical roots of words that Bill W. used in writing the Twelve Steps. Words can have very vague or very precise meanings, depending on who is using them and when. For example, lawyers choose words for their precise meanings. Bill W studied law for more than two years. He passed every class, but for some reason Bill never took the bar exam and so never earned the right to be called a "Lawyer". Still, Bill's legal training must have come in handy when he began writing the Big Book of Alcoholics Anonymous. He knew that the lives of his alcoholic readers were on the line when they read the Big Book. He was painfully aware that words could be slippery things, especially in the hands of alcoholics who were well-practiced in evasion and denial. When Bill re-examined the six Oxford Group tenants that helped him get sober, he reportedly found there too many loopholes in the wording; loopholes that alcoholics might use to wriggle out of sobriety. So, he recast those six tenants into twelve steps. I assume he did that to close those loopholes using clearer wording. My point is that I now pay close attention to the precise meanings of words in the original Twelve Step literature because I suspect Bill W. did too. I first got that idea from Joe & Charlie's "Big Book Comes Alive" lecture series. They carefully examined the exact definition of such words as "resent", "believe", "decide", and many others. I went an extra step and found a 1930-era Webster's Dictionary since it contained exactly the definitions Bill had at his disposal. Have I taken it too far? I suppose it is possible. I have no professional training that relates to recovery or the roots of word definitions. Most of what I have said above come from my own assumptions. But the process of looking up the precise definitions of Twelve Step words has helped me stay sober for another day. One day at a time. TRIVIA: I have read that Bill W. began writing the Big Book of AA under the strict editorial review of some 40 recovered alcoholics. They probably wanted the book to have the continuity and tone that comes from the pen of a single author. Unfortunately, there were countless disagreements about the words Bill W. chose. In a particularly important example, some loved the word "God" because of what it meant to them. Others objected to the word "God" because it meant something different to them. I have no idea how Bill and the group reconciled their differing definitions. It is possible someone pulled out a current Webster's dictionary and read this definition to the group: "God n. - a being of greater than human attributes and powers". Bill did settle on a similar phrase—a power greater than human power—to refer to God. Coincidence? Maybe. But, as a student of the law, Bill knew that choosing words with well-documented definitions was a wise strategy. This would ensure that if anyone raised later objections to the word "God", a dictionary could be used to settle the matter. Plus, there was another benefit to that strategy. In the early days of AA, the Big Book was mailed by the thousands (later millions) to individuals and groups across America. Since AA groups would be initially established in scattered and diverse locations, arguments over Twelve Step writings would have to be settled using locally-available resources—like a dictionary. Do I have any proof that Bill or any AA founder chose words by looking up their meaning in Webster's 1934 Dictionary? I do not. My speculations are just that. Your guess is as good as mine. Who Are "Joe and Charlie"? You will see several references on this site to "Joe & Charlie". Their names are sometimes heard at local Twelve Step meetings. So, who exactly are Joe and Charlie? They were two long-recovered alcoholics who traveled the world for several decades, sharing their insights into the Big Book of AA. Because all Twelve Step programs are derived from the AA Big Book, I suspect their recordings might help anyone in ANY Twelve Step program....not just AA. The Big Book Study (officially called "The Big Book Comes Alive") recordings are not conference-approved literature. Any sponsee interested in listening to the series should ask their sponsor first. I can recommend the talks with confidence because many long-sober speakers have openly given credit to Joe and Charlie with their own recovery. I have heard people say said they never really "got" how Twelve Step recovery works until they heard the free-wheeling and good-natured recordings of Joe P and Charlie McQ. I know that was true for me. To say it more clearly, Joe and Charlie's talks saved my life. When I first got into recovery, I could not really grasp what I was reading and I did not get sober. I was about to give up and go back out there. My kindly mother startled me by mailing me a complete set of the recordings. At first, I scoffed. Then, I listened. Honestly, I doubt I would be alive today if I had not heard that Old-School message carried directly to me by Joe and Charlie's talks. Joe and Charlie inspired my habit of looking up recovery-related words in the dictionary. Listening to two rough-hewn men casually discussing the Latin roots of the word "resentment" was stunning at first (i.e., I was startled to learn that to "resent" meant to "feel again". I had always inventoried my resentments as if the word meant to simply feel angry. With a new and more historically accurate definition in mind, the resentment inventory became much more powerful for me.) Bringing such mental discipline reading the Big Book had never occurred to me. Joe and Charlie's lifelong search for recovery in the Big Book still inspires me today through their recordings. This website is dedicated to the tireless work of Joe and Charlie, and the others behind the scenes who helped them carry their Message to thousands like me. Joe McQ passed away October 25th, 2007. Another gentleman (coincidentally named Joe) continued presenting the Big Book Study with Charlie P until the latter died in April of 21, 2011. All three of these men gave voluntarily of their time for many years, helping others gain a better understanding of the practice and history of Twelve Step recovery. Listening to Big Book Study recordings cannot change the importance of thoroughly reading the Big Book or your own recovery program's literature. But because the complete series of recordings lasts many hours, I believe only the most devoted sponsor could duplicate all the careful review of the Twelve Step process that is presented in these talks. If you go looking for these recordings online or elsewhere, you will probably find numerous versions of them. The exact content of Joe & Charlie's discussions changed surprisingly little over the years—I notice that recordings from the 1980s sound remarkably similar to talks given decades later. I suspect the pair saw many lives being saved by their original talk and made a strenuous effort not to change it for fear of "spoiling" its good results. I personally got sober while listening to one of their earliest recordings. However, the core material is the same over all the years of recordings. I happen to prefer the 1987 talk because it included Joe McQ in his full vibrancy at http://www.peopleschoicerecovery.com/contents/en-us/d135.html Please note that you may be able to find a free 1987 recording if you search more thoroughly than I did. DISCLAIMER: Neither of the above sites endorse my site, nor can I guarantee their current availability. Naturally, you may do your own search for Joe and Charlie's Big Book Study (officially titled "The Big Book Comes Alive"). May we meet you as you trudge the Road of Happy Destiny. God Bless you and keep you until then. What's the REAL reason for this site? When I first achieved lengthy sobriety, I found that every word in the Big Book made much more sense to me. I thought I could get others sober by sharing the Big Book, word for word. However, I had difficulty getting others to see what I was seeing. I would speak with passion and confidence and verve and clarity—only to see their eyes glaze over with boredom. I have since discovered this is not unusual. Even AA co-founder Bill Wilson spent months of early sobriety going from bar-to-bar, trying to share his spiritual experience with other drunks. I had no better luck than Bill did. I did not give up. I still worked with others. I encouraged them to listen to "The Big Book Comes Alive" study (see the "Who are Joe and Charlie?" link in the far right column of this website). Unfortunately, most newcomers were far too rattled to patiently sit and listen to these recordings. They needed smaller bites of information. I wanted to call attention to those 1930s definitions of Twelve Steps words. That's the REAL reason for this site twelvedrawings.com. FAIR WARNING: This website is not conference-approved by any Twelve Step program. If you don't understand why, I strongly suggest you ask your sponsor or anyone who has long-term sobriety in your program. Conference approved literature has been carefully reviewed hundreds of times by countless sober people. The information is considered safe and sound for use in recovery work. By comparison, only one person has reviewed the information on this website. Please be wary of the information on this site or on personal sites like this. Common sense should tell you this. You don't know anything about me (the sole person involved in creating the artwork and writing). You have no way of knowing whether I am sober now or ever have been. I warn my sponsees that their desperation for recovery will cause them to latch onto ANY idea that sounds good to them. Worse, they will eagerly believe anything which reinforces their incorrect old assumptions, biases, sickness, etc. So please do NOT assume that just because you find my pictures to be interesting or because you agree with anything written here, that you are headed towards sobriety. If you are not yet sober, I urge you to leave this site right now. It will only confuse you. I am very serious about this. However, if you have become sober using the Twelve Steps as first outlined in the book Alcholics Anonymous (the "Big Book"), then this site may be of interest. My words and images are personal shares, comparable to someone sharing their experience, strength, and hope in a face-to-face meeting. If someone's share includes statements that are not found in conference-approved literature, everyone in the meeting should know to ignore that part of the share (e.g., If someone shares, "I could not get sober if I did not take a hot shower while chanting the Pledge of Allegiance before working the Steps every day." My reaction would be: "Good for you, friend. But that is not found anywhere in the Big Book so it is NOT necessary in order to achieve sobriety.") Please approach what I have shared here with that same caution. I hope you find inspiration. I pray you find experience, strength, and hope. But you will only find sobriety through the grace of God as you understand God. And the most reliable path I know to that Higher Power is to 1) attend meetings, 2) get a sponsor, and 3) work the Twelve Steps daily and without holding anything back. Once graced with sobriety, I invite you to come back here. Maybe what seemed mildly interesting during your first visit will become more meaningful with each new visit during your lifetime of recovery. I have begun a new series of TwelveDrawings titled "ReligiousOrNot". Here's why. The Twelve Steps were published in the year 1939 in a book titled Alcoholics Anonymous (known commonly as the Big Book). Among its 500-plus pages, the word "God" appears nearly 300 times. I myself would assume that any book containing that many references to God must be a very, very religious book. (A nit-picker might easily argue against my assumption. There are many books which examine that word from a purely historical, academic, or cultural perspective without promoting any religious beliefs. And there are many books which might mention that word in passing while attacking any or all institutions of religion.) Still, I believe that the notion that where there is smoke there is fire. Likewise, where a book has the word "God" mentioned in a positive context on so many of its pages, there is bound to be some sort of religious message being delivered. Or so I once believed. Now that I have spent more than a decade reading and using the book Alcoholics Anonymous, I no longer believe the word "religious" applies to it. If you agree with me, there are many of us. If you disagree, there are as many (or more) who feel as you do. You may also fall into the sizable "Frankly I don't care either way" category. That's fine. Reasonable people often disagree. As it happens, the Big Book's author, Bill Wilson, attended law school. He passed all of his courses but his drinking took a turn for the worse and he never practiced law. Bill likely knew of Black's Law Dictionary but he also knew that only a fraction of his intended readers—the lawyers—would know of it. So, if Bill Wilson's readers wanted to look up the meaning of a word like "religion", he knew they would turn to a commonly available dictionary. Since I wanted to interpret words just as Bill's earliest 1939 readers did, I acquired the most authoritative dictionary for American English in his day: a Webster's New International Dictionary Second Edition, published in 1934. (The Third Edition would not be published until the 1960s). Religion n. - The service and adoration of God or a god as expressed in forms of worship, in obedience to divine commands, esp. as found in accepted sacred writings or as declared by recognized teachers and in the pursuit of a way of life regarded as incumbent on true believers. Whew! I labored to read and understand it. Some words came quickly while others came slowly. I knew the job of defining religion would be challenging, but this one must have kept Webster's lexicographers, etymologists, and editors working overtime. This definition seemed to ramble endlessly, which thwarted my ambition to create just one illustration for this very important word. I had been prepared for a tough assignment, but not for this! Service n. - the occupation, condition, or status of a servant, now esp. a domestic servant. Writings n. - specif., act, art, or product of forming letters and characters on paper, wood, stone, etc. to record the ideas which characters and words express, or to communicate them by words or sounds. Way n. - direction of motion, progress, facing, pointing, etc. Regardless, I had found the basis for a new set of Twelve Drawings. I gave the new set a working title of "ReligionOrNot". I chose that name to reflect a long-running debate about whether people in Recovery are "religious" or not. Even outside of Recovery, I often hear people describe their own beliefs as "spiritual, but not religious". I also chose this name to acknowledge the biggest question of all......."Does it even matter whether we agree that Recovery is religious or not, as long as it works?" You can ask that question yourself. Or not. If someone asks me today, I confidently answer "doesn't matter". But my trusty Webster's dictionary has shed much new light on my view of Twelve Step recovery. So I am open to being proven totallly wrong. I have begun the new set of drawings and will continue at my usual glacial pace. (I draw in my spare time and spare time is hard to find.) Please check my Twitter profile at @TwelveDrawings if you wish to see new drawings—like "Command"—as they are completed. As I finish each "Religious or Not?" drawing, I will post it in my Twitter profile which is @twelvedrawings. Thank you for reading. And please keep coming back to whatever religion, belief, spiritual experience, and/or program of Recovery nourishes your spirit. TRIVIA: There are five prior sets of TwelveDrawing.com series, including Serenity Prayer, Twelve Steps, Twelve Promises, Twelve Metaphors, and Twelve Insanities. All but the last set are already posted on this website as of this writing. The Insanities will be added when I begin a monthly rotation which showcases just three sets of TwelveDrawings at a time. What about the other definitions? At first, it seemed reasonable to base my drawings on purely modern definitions. The language in the Big Book of AA certainly looks and sounds much like the English of today. But further reading of my musty 1934 Webster's New International Dictionary revealed that the older definitions #2 and #3 (below) were very different from their 2012 counterparts. • COLLEGIATE DICTIONARY: The dictionaries that most people have on their shelf are "collegiate dictionaries". Traditional collegiate dictionaries were edited down to a length that was convenient for students to carrying to and from school. (Today's portable electronics make it possible for students to carry any amount of information, without worrying about size and weight.) Collegiate editing typically involved eliminating rare words and/or obscure definitions. Most collegiate dictionaries arranged definitions in order from the most common definition to the least—just as my grade school teachers told me. 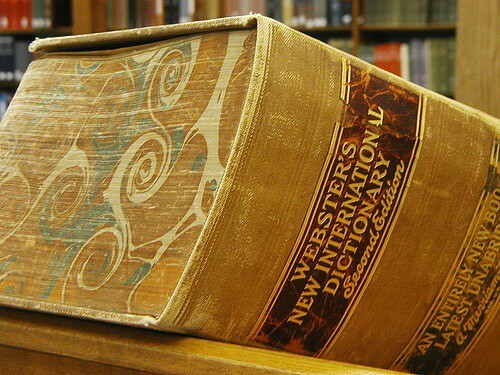 • UNABRIDGED DICTIONARY: An "unabridged dictionary" (like my 1934 Webster's, shown below) strives to present every known definition of every word. Because it contains so many more words and definitions than a collegiate dictionary, the book itself is much larger and heavier. In fact, an unabridged dictionary is so large that libraries often mount them on a strong pedestal. The first definition listed in an unabridged dictionary is not the most popular one; rather it is the oldest one. The written introduction in my 1934 dictionary confirms this on page xiii: "In general the arrangement of meanings of words of many meanings in the Dictionary has been according to the following practice. The earliest meaning ascertainable is always first, whether it is literary, technical, historical, or obsolete. Meanings of later derivation are arranged in the order shown to be most probably be dated citations and semantic development." If the first definition is the oldest one, might the word be too old to be useful? No. If that first definition is so old that no one uses it anymore, it is clearly labeled as "obsolete" or "archaic". I disregarded those definitions. Today, most Americans probably don't give much thought to how old their word definitions are. Abandoning the formality of their grandparent's school days, today's Americans favor word choices that are creative and expressive—sometimes at the expense of the word's precise definition. AA's Bill Wilson's first studied grammar in the early 1900s, when writing styles were much more rigid than they are today. Bill attended private school in New England and later studied law in New York state. In both instances, enormous importance was placed on utilizing precise words which have meanings that cannot be misconstrued by others. Bill probably knew that the Big Book would face two very severe tests. First, it needed to speak to alcohlics in a way that bypassed their habitual distortion of other people's words. For example, if Bill had used slang or any other loosely defined vocabulary, alcoholics could have found the loopholes they needed to dismiss him and his message. Secondly, the writing needed to survive the continual shifts in meaning that words inevitably undergo over many years. Bill needed words with meanings that would remain unchanged for many years. In both cases, Bill would have been wise to use the #1 definition from an unabridged dictionary. This would prevent the alcoholic from skipping through all of the definitions, looking for one that contradicted Bill's intended meaning. It would also ensure that for many decades to come, an interested Big Book reader could find an unchanging definition for the words that Bill chose with such care when so many lives depended on his success. HEY ARTIST, ARE YOU STILL ALIVE? — As of December 30, 2017, I am very alive and gratefully still sober. I am late middle-aged and not likely to die of old age soon. For now, I am physically healthy and relatively sane. I post regularly on Twitter, so if you see @TwelveDrawings is active, that means I am still breathing. ARE YOU STILL SOBER? — As 2018 approaches, I am sober Today. I started my drawings in about 2007 and put up this site in 2011. By the grace of God, I have been sober all of that time. For me, a million sober yesterdays would not prove I could "coast" in my sobriety work Today. HOW DID YOU DO IT? — I didn't. My Higher Power did. At my very first meeting, they closed with the words, "It works if you work it but you've got to work it ever day." That is the most concrete and practical suggestion I know of, other than the Steps themselves. ARE YOU STILL MAKING NEW DRAWINGS? — No. After completing six sets of "TwelveDrawings" (a total of 72 illustrations), I felt I was finished; I stopped drawing as abruptly as I started. Four of those sets of drawings are currently posted on this site. I would have gladly put up the other two sets, but I can't remember how that is done. (Lame, I know.) You can get a peek at some of those later drawings in my Twitter photos @TwelveDrawings. WHY DOES THIS SITE NEVER CHANGE? — Unfortunately, I have not updated it much and it is very flawed from a technology perspective. Sometimes, when you open a page, there is a huge pink area filled with red letters, characters, and numbers. I don't know how to fix that glitch, but if click "refresh" in your browser once or twice, it will fix itself. I have heard addiction experts—even some belonging to AA— who minimize or totally ignore Dr. Silkworth's use of the word "allergy". Some physicians hint that Dr. Silkworth made a misdiagnosis based on inferior medical knowledge. Others suggest that he was employing some sort of metaphor. (A "metaphor" is the application of a word or phrase which is not literally applicable. Example: "Laziness is a CANCER spreading through society.") I studied the history of the medical term "allergy" and I believe that today's skeptics misunderstand Dr. Silkworth's use of the word. Did the Doctor make a misdiagnosis? That is very unlikely. When he made the statement, Dr. Silkworth had already treated over 5,000 patients for various levels of alcohol abuse. He described only the most severe cases as suffering from an "allergy". Perhaps our difficulty in understanding him arises from OUR current use of the word. Most people now think of an "allergy" as some sort of histamine reaction (i.e., hay fever, pet allergies, poison ivy, bee allergies). The word "allergy" had a different meaning in Dr. Silkworth's time. The medical term was created in 1906 by an Austrian doctor (http://en.wikipedia.org/wiki/Clemens_von_Pirquet) who noticed that some patients safely tolerated a vaccine for a while, but they later experienced a dangerously different reaction to later doses of the same vaccine. That Austrian doctor published his findings and by the 1930s, his meaning of "allergy" was widely known among physicians of Dr. Silkworth's era. Our current notions of sneezy, watery-eyed allergic reactions came from the anti-histamine drug advertising. Did the Doctor use the word "allergy" as a metaphor? This metaphor idea seemed very possible to me at first. Now, I seriously doubt it. Dr. Silkworth was giving his opinion as a physician, not as a poet or creative writer. A physician has no reason to employ a precise medical term like "allergy" unless he is describing that exact condition. A doctor would confuse his readers if he wrote, "Alcoholism is a cancer" (or any other bona fide medical diagnosis). The chance of being misinterpreted would be too great. An educated person like a physician could easily think of clearer examples if he were striving to find a metaphor. My conclusion is that he was speaking literally. I believe Doctor Silkworth used the term "allergy" according to the medical definition in use at the time. I am not a doctor but it appears to me that Dr. Silkworth was describing those drinkers who drank safely at first, but who eventually experienced a dangerously different reaction. He wasn't referring to itching or sneezing. He was describing people who drank at 20 years old with no serious physical problems but who experienced inexplicably different reactions later. Many respectable citizens were almost dead of horrifying and seemingly incurable alcoholism by middle-age. Same substance; different reaction. In 1939 (when the Big Book was written) the correct diagnosis for that reaction was an "allergy". I personally am convinced that the "allergy" diagnosis in the Doctor's Opinion of the Big Book is rooted in solid science, not in metaphor or outdated medicine. Regardless, I am grateful for the pioneering work performed by Dr. Silkworth and countless others in the early days of Twelve Step recovery. These groups are not connected to this website or the images or words presented here.